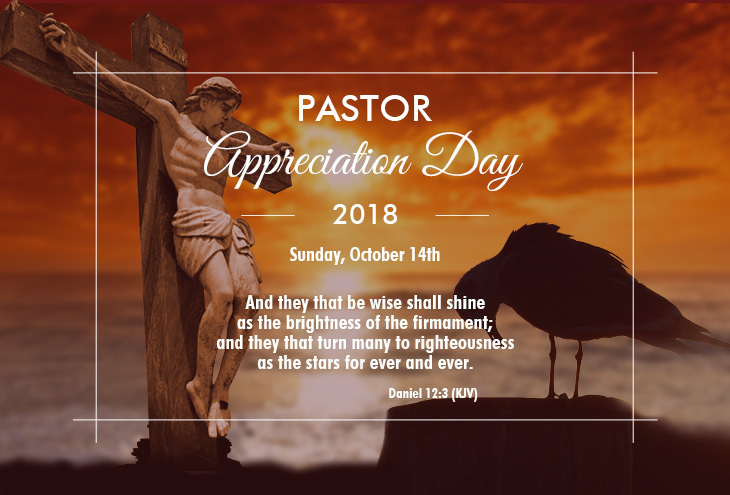 October is Pastor Appreciation Month and October 14, 2018 is Pastor Appreciation Day. Pastor Appreciation should be more than just a designated event on the calendar. The focus of this positive, faith based website is to challenge churches and congregations to honor and encourage pastors throughout the year. Clergy Appreciation Month began in 1992 as a way to encourage congregations to show their appreciation, love and support for their pastors. This affirmation can provide new life and energy for a pastor who may be dealing with burnout, disillusionment, frustration, isolation, or stress. 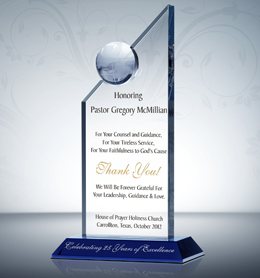 Because pastors are often "on call" around the clock, special recognition for the work they do is more than called for. Pastor Appreciation Day/Month is a great opportunity for individuals and the church, as a whole, to show love and appreciation for their pastor. Using tangible "thank you" ideas to express gratitude is a special way to honor the clergy and thank their devoted family members. Here are some suggestions to put to use during pastor appreciation month. Plan a special banquet. Invite a guest speaker and prepare a program that fits the personality of your pastor. A “This Is Your Life” DVD or celebrity-style roast are two pastor appreciation ideas that are both personal and lighthearted. Creatively communicate words of encouragement to your pastor for his or her service to God and the Church. Take special care to listen and respond to your pastor’s sermons. Listen to the Pastor Appreciation Day Speech and share your point of view with your pastor. Team up with your local Christian bookstore or radio station to recognize and honor your pastoral families with activities involving your faith based community. Send a Pastor Appreciation Day gift basket which includes thoughtful gifts for your pastor’s kids and your pastor’s wife. Be aware of the unique needs of the pastor’s children by providing financial help for camp, youth group retreats or missionary trips. Surprise you pastor and spouse with a cruise or vacation package to a special destination you’ve heard them talk about. Invite them to a dinner or party with your family and friends. 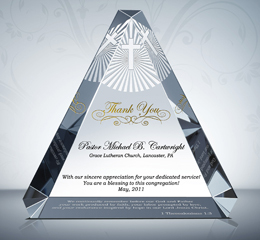 There are many different types of personalized pastor appreciation gifts available this Clergy Appreciation Month, the most popular being a crystal pastor plaque. 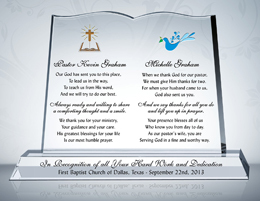 Customize a hand-crafted Pastor Appreciation Day plaque with engraved appreciation wording like a poem or a meaningful quote. 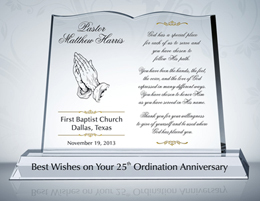 This type of personalized gift is becoming a trend at DiyAwards.com during Pastor Appreciation Month 2015. 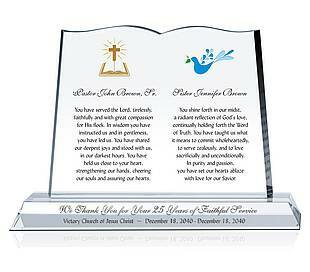 Resembling the shape of a bible, the Crystal Book makes a unique anniversary tribute rejoicing with those celebrating pastor anniversaries. Giving acknowledgement to a pastor's wife is an essential but often neglected part of pastor appreciation. It is important to also recognize the efforts & sacrifices of pastor's wives. People in the ministry devote their lives to God's cause. They help make our lives better through their faith and compassion. 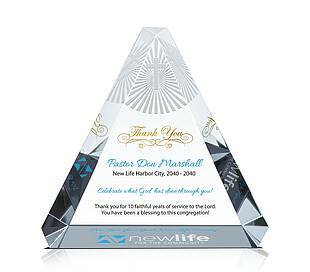 A personalized thank you gift for pastors offers a tangible way to express our heartfelt gratitude. Let the light of your faith shine. The radiant cross shines on top and reflects throughout the crystal giving it a religious effect. 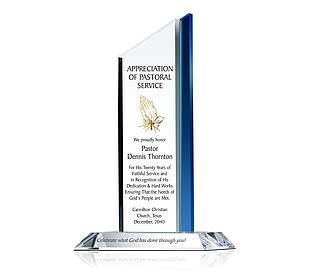 A big "Thank You", embossed and accented in Gold, proudly proclaims the center of this appreciation plaque.